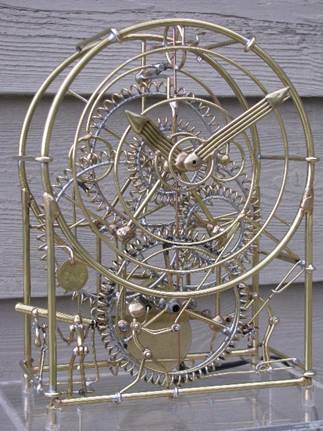 These kinetic sculpture clocks by Gordon Bradt have been handcrafted in brazed and molten solid brass right here at Kinetico Studios for thirty-five years. The clocks are highly polished and coated with clear lacquer. 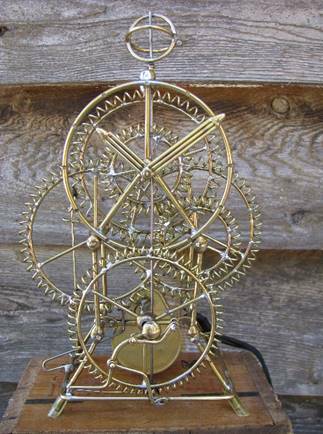 The little men and the unique coiled gear train are driven by an electric 4rpm synchronous motor, to keep accurate time. 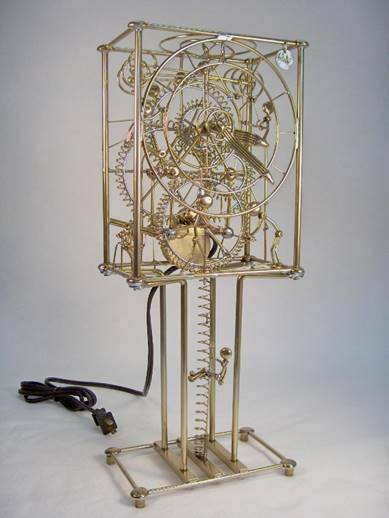 The Six Man Clock stands 9 inches tall. All men work away in realistic fashion, pushing and pulling various levers and cranks, appearing to be driving the clock. The Seven Man Clock stands 17.5 inches tall, employing an 8.5 inch pedestal underneath the Six Man Clock, with a seventh man riding up and down the pedestal. 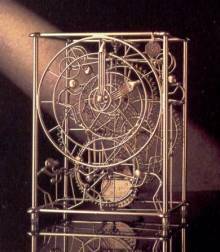 We briefly made the One Man Clock and the Three Man Clock in the 1980s, in the same scale and with the same gear train, just using different framing, or in the case of the One Man Clock, no frame at all. We build 110volt 60cycle models for domestic use, and 50cycle models for overseas collectors. See Clock Instructions for other specifications. Ebay is a good place to look for pre-owned Kinetico Bradt clocks. No matter what condition the clock is in, it can be restored later here at Kinetico Studios. Just figure our restoration fee into your final investment when bidding on clocks on Ebay. See our webpage Clock service for information about our restoration service.